Carlton neurofeedback center is a modern alternative to drugs or talk therapy. If you, or someone you know is suffering with another type of brain-based condition such as Bipolar Disorder, PTSD, Depression, Chronic Insomnia, or Autism, neurofeedback training can offer real, lasting change. Find out how we can help – Free! We offer a no risk, no obligation free evaluation so you can learn more. Contact us today and let us help you get the process started. Curious and interested in learning more? 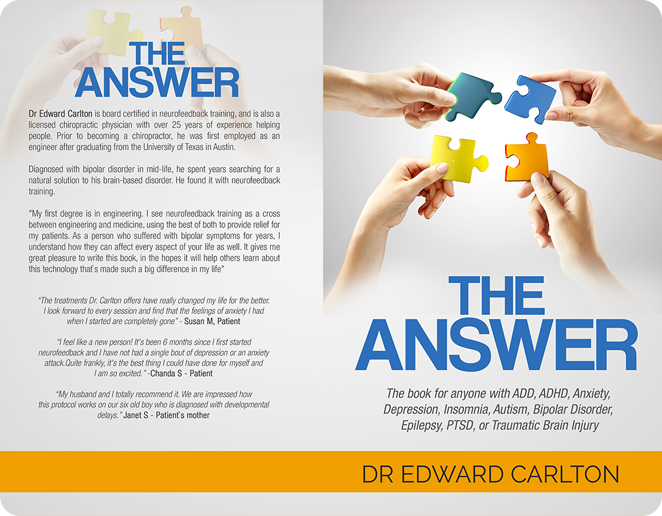 Check out our Free eBook: The Answer: Transform Your Life with Neurofeedback Training.